Laurence "Sunny" Bragg left his Norfolk, Virginia home to enlist in the US Army at age 17 on September 16, 1946. Upon completion of Airborne School and Glider Training, he was assigned to Gen. Jim Gavin's 82nd Airborne Division in Europe as part of the occupation forces. Sunny returned to civilian life and attended the University of Virginia graduating on October 13, 1955. He reenlisted in the Army where he attended Officer's Candidate School and was commissioned a 2nd Lieutenant assigned in the Infantry Branch. Sunny applied for Ranger training and graduated with Ranger Class 7 in 1966. 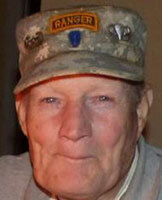 Ranger Bragg was then assigned to the 101st Airborne Division in Korea. Sunny ended his second enlistment on September 12, 1958 at the rank of 1st Lieutenant. Retiring in the Dahlonega, Georgia area, Ranger Bragg joined the U.S. Mountain Ranger Association. He was active in the association serving as the vice-chairman and in many unofficial duties. All this he performed even after losing a leg which confined him to a wheelchair. Sunny's awards include Ranger Tab, Jump Wings, Glider Patch, World War II Victory Medal, and other meritorious awards. Sunny Bragg passed away peacefully at his home on Dahlonega on March 22, 2016.